In 2015 Cadbury introduced a Vegemite variant as part of a marketing stunt around the launch of left-field flavours. Dairy Milk with Vegemite was available nationally for a limited time only alongside Pretzel and Peanut, Salted Caramel and Golden Toffee flavours. 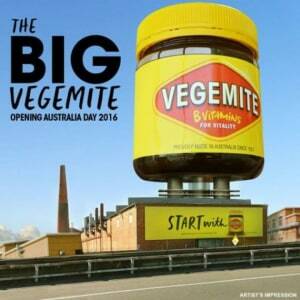 Did you know Vegemite was one of first Australian advertisers to launch paid ads on Instagram? See here. Iconic Australian spread Vegemite, which first hit supermarket shelves in 1922, has been bought back from American multinational Mondelēz International, by grassroots brand Bega Cheese. The A$460 million dollar deal also includes other Kraft labels such as salad dressing and mayonnaise brand Zoosh and beef cooking stock Bonox. Bega will also get the license for Dairylea and KraftEasy Mac & Cheese. It is yet to be seen how or if this buy back will affect the campaign strategies and marketing of Vegemite, which still uses the 1954 theme song 'Happy Little Vegemites'. The intention is for the Port Melbourne facilities to remain fully operational and all the relevant staff to transfer to Bega Cheese employment. Bega Cheese executive chairman, Barry Irvin, says he is “incredibly proud” that a company which began as a dairy farmer will today acquire something so culturally significant. “We feel honoured to be bringing these businesses together and to be taking on the responsibility and guardianship of one of Australia’s most loved brands” Irvin says. Originally owned by the Fred Walker Company, the brand was absorbed by Kraft in 1935 after the death of Fred Walker. In 2012, Kraft was restructured and Kraft Foods Inc was in turn renamed Mondelēz, which has owned Vegemite for the last five years. For Mondelēz, this departure means a larger focus on its snacks and confectionery brands, Cadbury Dairy Milk, Oreo, The Natural Confectionery Co and Philadelphia cheese. Australian vice president of Mondelēz, Amanda Banfield, said the “time was right” for Vegemite to take the next step in its journey. Mondelez to offload top brand - will Kraft/Heinz bid?